Temple of the Shrine dedicated to Our Lady of the Water Sports Prodigy. In a stormy crossing of the Adriatic, on the night of September 12, 1669, the family of Count Antonio Zancaropulo Berardo escaping from Crete, sought shelter in Venice. During the terrible storm, a simple wooden table, to which they cling, is their salvation. On the table is painted a small picture of the Byzantine Madonna and Child, which was spontaneously given the title of Our Lady of the miracle. This picture was held, until 1820, among the most precious things possessed by the family of the Count, and venerated by sailors that were conferred special protection. On July 20, 1822, on the occasion of the marriage of Margaret, a descendant of the family Zancaropulo Berardo, the miraculous icon was moved to Salvaterra Polesine, and after various wanderings arrives in 1915, went by the parish priest Msgr. Antonio Pagani, to Garzola Como. Behind the wooden board, which bears the image of Our Lady of the miracle, we can still read, engraved by hand, the wonderful story: "Authentic history de Imagine the Blessed Virgin Mary, which is responsible for dominical House Salvaterra ... there, September 12, 1669, started from Candia already fallen into the hands of the Turks, the family of Count Antonio Zancaropulo Berardo Nobile Cretan city of Hania, his ship suffered a terrible storm on the way to Venice. When scopertasi, in greater danger and about to get lost, this Imagine floating on the sea, was eagerly collected and immediately calmed the storm and prosperous journey came to Venice ... ". 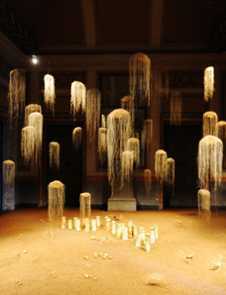 Mons. Antonio Pagani, eager to devote to this picture a temple, started construction, with the laying of the foundation stone October 26, 1919. Work is under way among many difficulties until 1922, however, reaching only 5 feet tall perimeter walls, and the work remains unfinished. 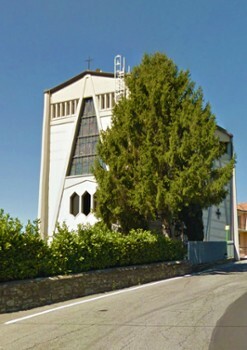 In 1957 when he arrived as pastor at Garzola, Don Luigi Galli is a small chapel in which is venerated Byzantine Madonna and Child, under the title of Our Lady of the miracle. Don Luigi, who in his youth attended "Rowing Cernobbio", and as a priest competes in Centomiglia speedboat, practice the sport of rowing; is admired and enthusiastic sports events on the lake, and for the companies of Water Sports in the area, who have a big roll of honor Olympic titles, World, European and national. 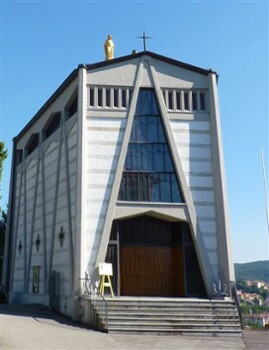 Protection of mariners in distress, attributed to Our Lady of the miracle, and the sporting passion mature this priest the bright idea to erect a Temple Shrine which is like the Upper Room for all those who practice spiritual nautical disciplines. He presented his project to Pope John XXIII, called in the prophecy of Nostradamus, "Pastor et Nauta", "Shepherd and Nocchiero", and obtains approval and encouragement, with a document from the Secretary of State in 1959. Pope John XXIII, already seriously sick, dated May 29, 1963, three days before his death, sending a message of encouragement and blessing for the successful realization of the work. Paul VI blesses the work began in 1965, and the inauguration of the Temple March 24, 1968; at the hearing to sportsmen for the Holy Year, 8 November 1975 renews its approval. John Paul II, at the hearing on 14 November 1990, puts it this way: "A special greeting goes to the pilgrims of the Parish of Garzola and the athletes and organizers of the Sports Water who revere as their patroness the Virgin of the miracle. I pray for you, dear fans and lovers of Sport Nautico, Mary "Star of the Sea," because there is protection and guidance for the full realization of the Christian life. " The Temple is a jewel of modern architecture in reinforced concrete, the work of architect. Fulvio Cappelletti, hexagonal shaped elongated, so as to assume the appearance of a ship. Inside, a large classroom walled brickwork and concrete ribs that recall the rigging and ropes of the ship, is refined by stained-glass windows depicting the Madonna of the miracle, on a stormy sea, and Pope John XXIII , "Pastor et Nauta", with lower Jesus the Good Shepherd, with the flock of the faithful, and St. Peter's Church that guides the boat on a stormy sea. In the area below the temple is made Shrine: a room shaped like a ship of the same size of the Church, which houses, in specific boards, the relics of the samples of the various nautical disciplines: waterskiing, swimming, boating, rowing and canoeing, sailing, sport fishing and diving. Space are also an original "Nativity Marino" made with sun shells, and a section of marine biology. Guided tours available everyday by prior arrangement. Nearby Things to Do include: Monuments such as Statue of Alessandro Volta and Alessandro Volta Tomb; Castles & Ruins such as Como Gate Tower and Broletto; Museums such as Arte & Arte and Silk Museum; Towns such as Brunate and Blevio; Villas such as Palazzo Giovio and Villa Geno; Churches such as Santa Cecilia and Basilica di San Fedele.